Leo and I hit the water and went right to work on the trout in the Caney Fork River, below Center Hill Dam. We hit the slam early and began looking for the bigger fish. Leo brought his T3, which he let me throw. It's the first T3 I could really get the right accuracy and distance with, well as close to the target and as far as I can get anyway. We had several discussions about fly rods and lines, and how they match some anglers casting styles better than other angler's casting styles. We talked gear a lot as we moved down the river. Last week we noticed the brown's color increasing for the fall and this week we noticed the brook trout color becoming more vivid. The brookie above grabbed a nymph and began the fight for release. Fortunately for us the fish came to the net and confirmed the Caney is, at the very least, decent water for brook trout. As long as we continue to avoid rain events and the water temps in the Caney do not get too crazy, we may have some fine brook trout in the upcoming spring. Grumpy and Dan floated around us most of the day. The day started off partly cloudy and a little warm. Then the air cooled and the breeze picked up. The raindrops first came down just a little. I made Leo step back up to the casting race and start fishing again. A short time after that the hard rain came and Grumpy snapped this photo. After some pretty hard rains the river began to collect leaves and the water took on some color. We continued to fish nymphs and when the rain slowed to a stop we went back on top search for the few feeding fish. Over the past month we have come to the river and found fish feeding on midges. This week we saw few rises. But we went after those rises and would pick up a fish here and there for our effort. We saw a small rise next to a downfall, Leo tossed the offering in, and the rainbow came to the top. The fished nailed the fly and Leo set the hook! As the storms passed and the fog set-in we fished our way to the ramp. The crowds thinned out pretty quick as the day wore on. A few waders here and there, along with a canoe/kayak hatch coming on occasionally. Nymphs are working and some midges are taking fish as well. We didn't fish ants, but red ants under downfalls could work after a hard rain. Leo is a fan of the soft hackle, which work best when wading. 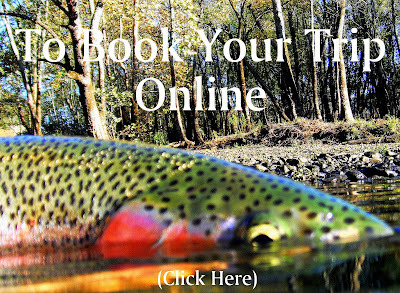 With the low water levels it would be a good time to hit the shoals and gravel bars with a good soft hackle swing. It looks like I will be back later in the week, so look for another report and update on the river conditions. We have been back on the Caney Fork after last week’s significant rain event. Nashville and the Cumberland Plateau both experienced flood conditions again. This time the rain was not the monumental flood that occurred in May of this year. Every ditch and creek that flows into the Caney Fork has been cleaned from the heavy rain. There is a small gravel bar at the mouth of the creeks and some of the gravel bars have tires sitting on them. My suspicion is, the ditches have been eroding and people had been trying to stop the erosion with tires. Some tires have been dislodged and now are sitting on the gravel bars. Those tires may provide some future fish habitat. Now don’t get me wrong the river is not full of old tires, this is just an FYI that we noticed since the heavy rains. There you have it, some river trivia if you will and nothing to be alarmed about. Along the lines of the gravel bars, there are now nice little pools downriver of the newly spilled gravel and some of those pools may hold a fish or two. This brings us to the next point, which is, there are changes in the river bottom. This is not significant news, but is worth considering when wading and adjusting those indicators. The generation over the past weeks has been good and the forecast appears to be unchanged. 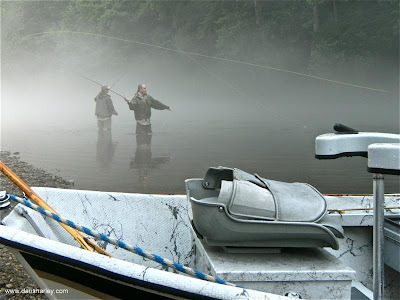 The water is low later in the day, but anglers should be ready for the water to fall out a little slower due to the extra sluice and the high levels of the Cumberland downstream. The water eventually falls out to low dry fly levels; it just takes a little longer than most folks like, me included! On a recent trip Anthony and I got into some Caney Fork Hatchery Brats. We both noticed the browns and rainbows are beginning to fatten up and they are growing slightly in length as well. The browns are beginning to change their colors as they are getting ready for the fall spawn (attempt). The browns that miss their opportunity to attempt their spawn will hopefully have accelerated growth and be ahead in size by next spring. There are already some colorful six month browns (this is an estimate, we didn’t ask for their birth certificate) that appear to be already getting a little extra length. Curiously the brook trout are not showing the same amount of growth, or presence for that matter. Some of the reasons could be that not as many have been stocked or we just haven’t gotten into them as of late. However, there is a report of a 16” brookie caught in the river within the past few weeks. Even on the +2” Caney scale that is a nice brookie. Over the past few trips we have been stopping at a nice hole to fish. There are fish in the hole, probably more fish than we know. The fish have been feeding just under the surface each time we stop and not real interested in dries. So, last week we stopped and we fished nymphs. Anthony was on the oars and gave me the opportunity to try some different things. He put the drifter in exactly the right position and dropped the anchor, just like an old pro or as he coined the phrase, just like a guide’s guide would do. We determined there are fish in the hole and then we determined there are a lot of fish in the hole. After several good drifts we brought several fish to the net and now the Guide’s Guide Hole has been born. The canoe hatches are slowly tapering off now that school is back in session and in addition to the cooler weather that is just around the corner. The fish will sulk when a boat passes over their head, but they will come right back and start feeding again after just a few minutes of calm…..or should we say calm by the Caney Fork standards anyway. There is one caveat to this statement and it is when people make a lot of noise in the aluminum canoes. The fish come back, but it seems to take somewhat longer for the fish to recover after the apparent shock of paddles hitting aluminum. Eventually, if anglers can wait long enough, the fish can clear the “ringing in their heads” and they will resume their normal feeding activity. There it is, the report from last week and hopefully folks can gain some knowledge from the information. The water is still cold and the fish are still feisty. If you are thinking about planning a trip, now would be an excellent time to book it. We have caught nice fish over the past few months and most on top water. Top water fishing is some of the best action on the river right now, heck all year for that matter. The fish are looking up and the browns are beginning to eat in preparation for the fall spawn. If we do not have another significant event the river should be real good in the coming weeks. Hope to see you on the water. Although the temperatures were in the upper 90's, it was a good day for Dave, from Banner Elk and his son Stephen, from Asheville to come and fish the Caney Fork River. The water was still cool, but unlike the previous trip with Curtis and Ellen, the water was much more clear and the afternoon storm came much later in the day. Curtis came along to try out a NuCanoe and spent the afternoon batting clean-up, which on this day was also a good place to be. Curtis was able to catch a couple real nice browns. One of those browns was a fish that Stephen had on the line for a moment and then lost.....at least that's our story anyway. We started the day with some casting lessons and then moved onto the proper mending and hookset. We fished nymphs early and the nymphs produced the usual hatchery brats in the upper part of the river. Folks on the river were very nice throughout the float, but the sun was unrelenting. With the high temps the fish were looking up, so we put the guys on top water and offered some high protein flies to the bigger Caney Fork trout. As we were floating down the river and engaged in good conversation we floated into one of my favorite holes. Most anglers overlook it, well some anglers overlook the hole. We fish it pretty hard most days. On this day we chose to fish the hole before moving to the next shoal. Stephen cast out toward the bank and as the fly settled down onto the surface of the water, a huge explosion erupted. He set the hook, but missed the fish. The fly was sailing back toward the boat when Stephen decelerated the rod and the fly landed about three rod lengths from the boat. The rainbow most have felt the fly hit the surface and came over to inspect. The first pass looked to be uneventful and we decided to leave the fly floating in the zone of the fish. The fish started downstream, but changed it's mind and rose to the surface. Then the bow took the fly, Stephen set the hook and the fight was on. The entire take was in slow motion. The fight however wasn't in slow motion. After a few minutes we got the fish to the net and after a quick photo we put the fish in the net for some rehab. Then Stephen did the honors of the release and we relived the take and the battle several times. Father and son trips are a lot of fun. Spending a few hours in a boat helps to slow life's pace and gives people time to catch up. The fishing is a good way to occupy the mind between conversations and fish brought to the net are a momentary celebration for the anglers. Overall this was a very nice day. The heat was extreme at times, but the guys stayed hydrated with the Gatoraide and water. We left some fish for Curtis and he did not let many get through. When the afternoon storm rolled in we headed for the take-out and loaded the drifter. It was a good day and I was glad to have the opportunity to guide such enjoyable company. I guided Ellen and Curtis on the Caney Fork and what a treat it was. Ellen had fished before but not extensively, Curtis is a repeat client who is very good with the long rod. I have to say it was an extremely enjoyable float. We saw some sights that are not often seen, made lots of inside jokes and generally had a nice relaxing day catching fish. We unloaded the drifter from the trailer and then the storm came. We waited it out in the truck, while the drifter continued to fill with rainwater. After the rain slacked off, I ran the shuttle, only to return in another downpour. The drifter continued to fill with water and we were all getting soaked to the bone. The temperature cooled a little and the river turned off color from the run-off. After a short explanation of the hows-n-whys of casting, mending and hook sets, we were off. Ellen struck early on a nymph pattern while Curtis picked up several on a streamer pattern. When Curtis switched to a dry dropper and picked up several bows in a row, Ellen was right behind him. After a quick bite we moved on. We rigged some high protein offerings and picked up some more fish on top. We spent a significant amount of time in the upper part of the float and then moved on. The traffic on the river was light and the people were friendly. Ellen is a former whitewater canoeist and got behind the oars for a section. She picked up on rowing the drifter pretty quick and we continued on toward the take-out and darkness. The early thunderstorm knocked down most of the bugs that flew earlier in the day. The rainwater run-off had stained the water, so there weren't many rises and the midge fall did not produce. Ellen continued hitting the skinny water on top, while Curtis went back to a successful streamer pattern and produced a tweener rainbow for our last fish of the day. The day ended and we loaded the drifter. Ellen had added several fish to her lifetime total and Curtis proved once again he is deadly with a streamer. The river fished pretty good on nymphs, streamers and on topwater. The storms soaked us to the bone, but they also cooled down what could have been a blistering float. We aren't done for the week and should have another report later. Thank you for checking in with us and hope to see you on the water. Between trips to the Smoky's and planning trips out West, Barry made time to get on the Caney for an afternoon float. The afternoon floats have become pretty popular this year. 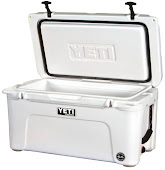 These floats are a good way to get out onto the water and they are more affordable too. For these reasons, along with the good fishing on low water, the afternoon floats seem to be a good value. We launched the drifter among a large group of canoes. The canoes were not as numerous as past weeks and with school starting the multiple large groups are beginning to thin out. The water was still up a little, from the two hour release/sluice that pushed 10,500 CFS of water through Center Hill Dam earlier in the day, but it was low enough to make the fish active early and a good upper float. Barry began the afternoon by hooking up with the hatchery brats early. We fished the big protein flies earlier in the float and were not disappointed. Well, we were not disappointed until a large brown hooked up, then jumped and made a clean break on 4 pound tippet. After his reflexes were tuned-up we turned our attention to the holdovers that were waiting. We were focused more on feeding fish for this float. When a fish would rise it would receive a drift from a fly shortly after. This method worked better on this float than some other floats this year. We continued on the pattern and soon Barry was in a fight with a holdover rainbow. 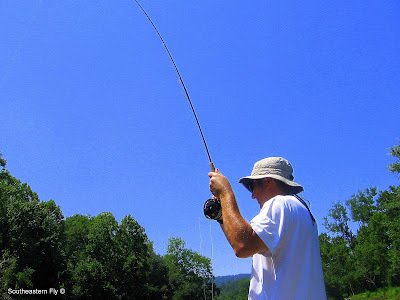 Once Barry was hooked up with the fish he got it on the reel and began to apply the side pressure. The fish tried to get loose and dug into its bag of rainbow tricks. No stump or downfall was off limits for this fish. Early in the fight the fish was going for the submerged wood and rocks at every turn, but Barry got the fish to turn it's head and then into open water. After some additional antics the bow made one last run under the boat and it then came to the net. This fish was a new boat record for rainbows this year. Barry did the honors of releasing the fish and we continued on down river casting to rising fish. It was another good float for the drifter. The boat was on the trailer, the rods were hung in the truck and the angler, well he seemed pretty satisfied that he had squeezed a trip in between the mountains and the West. 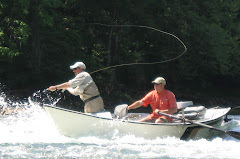 What can be said about Summer fishing on the Caney Fork? Summer brings less generation, midge hatches, canoe hatches, midges, did I already say midges, thunderstorms, rain and big fish. On this trip we started on midges, then onto nymphs and as the day wears on we went to the top. About this time last year was when the midge hatches were at their biggest and following a thunderstorm those same hatches were even bigger. This year has followed suit and we are getting the fish as they are looking up. The generation is favorable and the fish are cooperative, and looking up. Now is one of the best times of the year for a trip. Hey Mom Look What We Found! Another Nice Brown, but Where Am I?